Theodore Victor van Berckel married Anna Maria Nouhuijs on the 24th April 1763 in St-Jan Cathedral 's-Hertogenbosch. A new phase had started in his life because very shortly afterwards, the couple moved to Rotterdam. According to details of the Rotterdam City Archive, van Berckel was ‘admitted entirely to Rotterdam by order of the Roman Catholic Poor Council in the Leeuwenstraat’. We should not conclude from this that van Berckel was poor. The Poor Council was guarantor that the stranger Van Berckel was able to provide for himself and his family. Van Berckel established himself as an independent die cutter. We can not say with certainty whether he also worked as a silversmith in Rotterdam. The archives from this city on the river Meuse show that most of the children of the young couple were born in Rotterdam. It was fashionable in established circles in the 18th Century to have commemorative medals struck for wedding anniversaries. These medals were distributed, in limited numbers, to family members and important contacts. Evidently, these were precious presents that only the rich could afford. Silver was after all an expensive commodity and having medals struck was not cheap either. 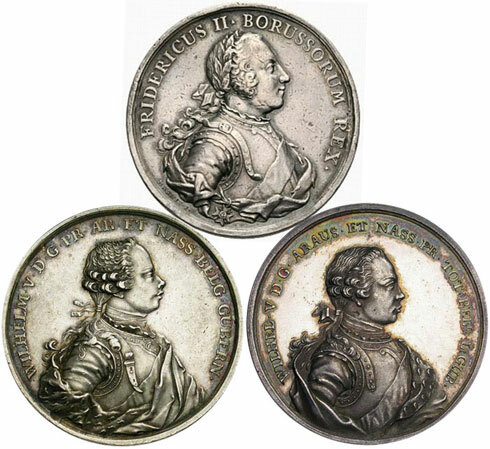 Theodore van Berckel made a number of these so-called family medals particularly during his ‘Rotterdam period’. The earliest known example of this type is from 1764 and was meant for the golden wedding anniversary of Johanna Judith Josselin and Gerard de Jong, Lord of Beek en Donk. 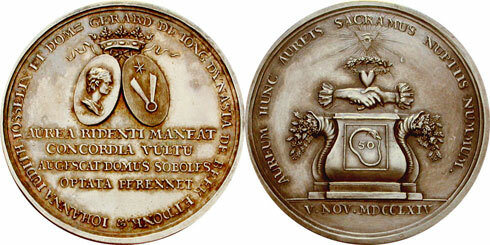 Golden wedding anniversary medal for the couple De Jong-Josselin, celebrated in 1764. Click the picture for an enlargement. Ex Auction nr.27, Karel de Geus – Veldhoven, april 2009. Stadholder Willem V reached maturity in 1766. Van Berckel produced a whole series of commemorative medals for the inauguration of the stadholder; for his marriage to Wilhelmina of Prussia and for the births of their children. It is very likely these were not ordered but were produced in the hope of selling them to the general public. Van Berckel portrayed the young stadholder on a number of medals as a Roman warrior, wearing cuirass, draperies and ermine coat. No doubt his inspiration came from examples by his tutor Marmé, who, several years earlier, had made a series of medals with the bust of the Prussian king Frederick the Great. The similarities are obvious. Above: Frederick the Great by Marmé (1745), below: two busts of William V by Van Berckel (1767 and 1766). 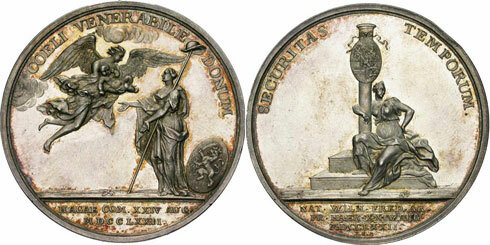 As was the case in 's-Hertogenbosch, city council medals were struck for Rotterdam from time to time as well. 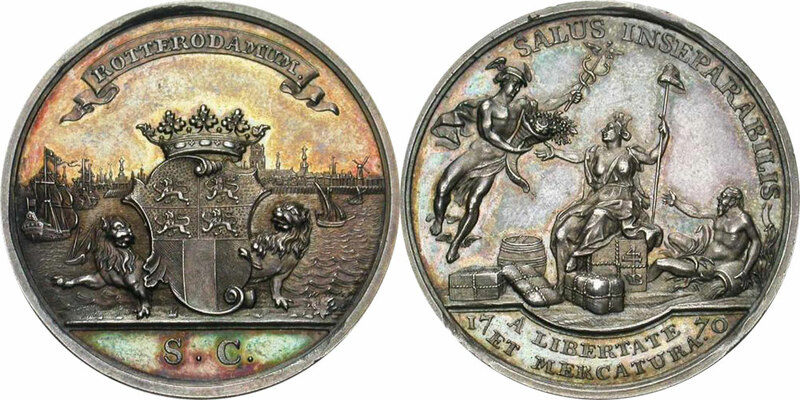 Because the dies had not been renewed for about fifty years, the Rotterdam city council decided on the 4th July 1769 to have a new council medal struck. The order was passed to Theodore van Berckel who had built a considerable reputation for himself. The council medal was presented to the Rotterdam council in 1770. Council medal for Rotterdam city. The Rotterdam archives offer little more information about the life and circumstances of Van Berckel. Fortunately we have his work as a silent witness. Take, for instance, the year 1772: in that year Van Berckel produced a large medal for the creation of the Art Appreciation Society from The Hague ‘Kunstliefde Spaart Geen Vlijt’ (4th January 1772), a number of commemorative medals for the second centenaries of the liberations of Flushing (April 1772) and West-Frisia (July 1772), a commemorative medal for the fire that demolished the Amsterdam Schouwburg theatre (7th May 1772). The fire at the Amsterdam Schouwburg on 7th May 1772. That Theodore van Berckel was industrious as an independent artisan in Rotterdam, is clear from ‘advertisements’ he placed in several newspapers at the time. 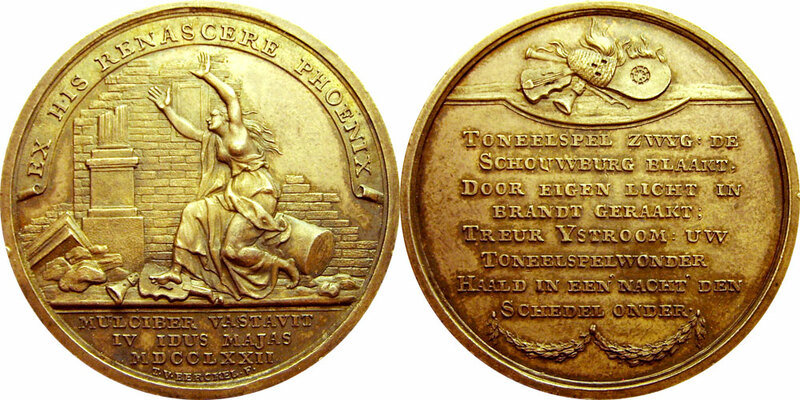 In the Rotterdamsche Courant of the 24th September 1772, we can read: ‘Produced by Theodore van Berckel, medallist established in Rotterdam, a medal for the joyous birth of William Frederick, crown prince of Orange’. 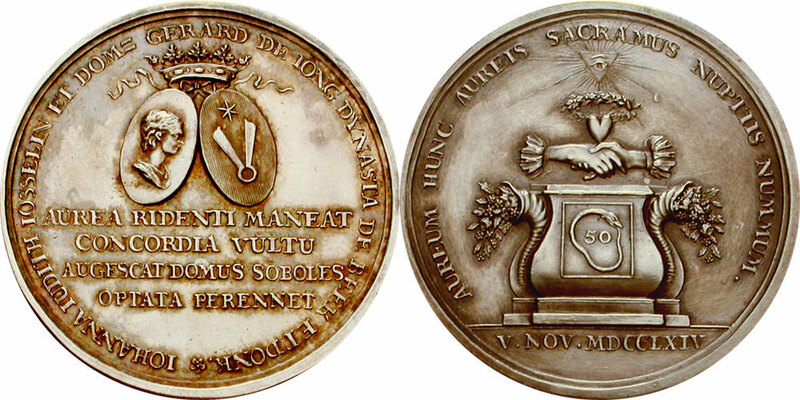 Unfortunately, we do not know which medal it concerns exactly; van Berckel struck three variants on the theme that year. The birth of crown prince William Frederick of Orange-Nassau, the later king William I Click the picture for an enlargement. Ex auction nr. 100, Jean Elsen - Brussels, March 2009.